12-year-old Maxwell Surprenant of Needham, Mass., recently started the My Joke for Jimmy Challenge and is encouraging others to join him via social media. 3. Make a donation to the Jimmy Fund. Then tag three friends and ask them to do the same. 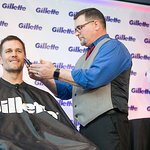 Well-known Bostonians have participated in the campaign including actress Eliza Dushku, business leaders as well as WCVB-TV/Channel 5 news personalities to support the Jimmy Fund which raises money solely to support pediatric and adult cancer care and research at Dana-Farber Cancer Institute. The challenge stems from an idea that Surprenant and his family entered into the Jimmy Fund Big Ideas Contest in June 2015. His idea was selected as the winner from more than 200 entries from 19 states. As part of the Jimmy Fund Big Ideas Contest the five finalists were assigned a mentor to provide initial feedback and direction prior to the final presentations. Suprenant was mentored by Bill Fine, President & General Manager, WCVB-TV / Channel 5.